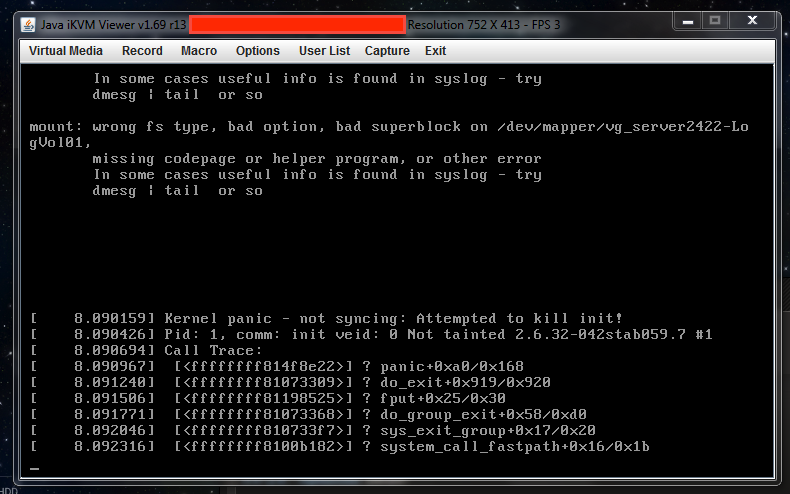 My server (CentOS 6) crashed, and it now kernel panics on boot. It's currently using a mdadm RAID1 array with two 1TB drives. vg_server2422-LogVol02 is the partition with all my data. I have booted into a CentOS 6.3 LiveCD via. the Virtual Media, and I have run lvscan, which returns the volumes as active. /dev/mapper/vg_server2422-LogVol02 contains a file system with errors, check forced. Error reading block 216006656 (Invalid argument) while reading inode and block bitmaps. Ignore error<y>? ...you get the idea. It continues for a long time. Trying to mount after that throws the same error (wrong fs type, bad option, bad superblock). I've tried all of the SuperBlock backups with fsck, they all do not work. I followed one of the suggestions at Recovering ext4 superblocks and ran mke2fs -S -b 4096, then fsck, however after a while fsck just crashed with "Segmentation Fault". Browse other questions tagged hard-disk data-recovery raid fsck or ask your own question.